Spring is here and summer is coming, and along with the warm weather is the potential for harsher skin allergies for pets. Fourth-year student Heather Darnall, left, monitors a patient’s heart rate during an allergy test. 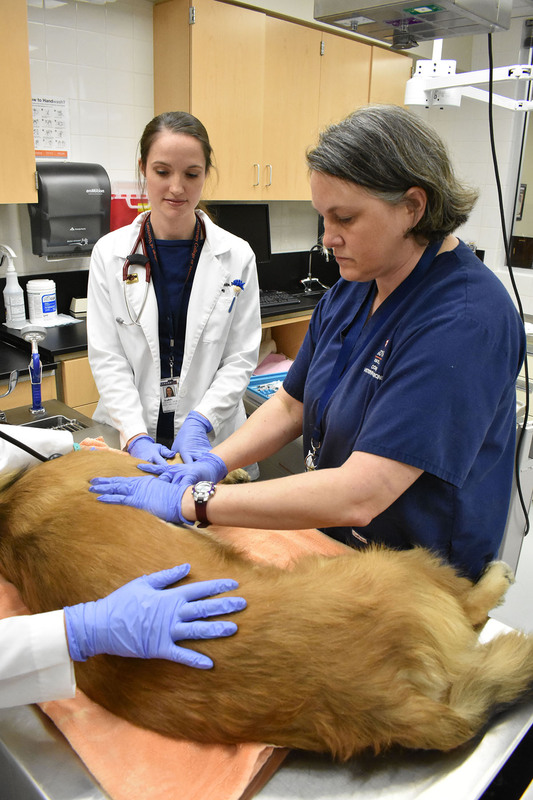 The Dermatology Service at the Wilford and Kate Bailey Small Animal Teaching Hospital at Auburn’s College of Veterinary Medicine can help. Signs also may include excessive licking, chewing and biting on themselves, head shaking, rubbing and over grooming (particularly with cats), throwing up hairballs and a pet’s desire to be scratched more than usual. If an owner sees these symptoms, it is wise to see their veterinarian, Dr. White said. Allergies are not contagious to humans or other pets, Dr. White says. Pet owners still can take precautions to reduce the recurrence of symptoms by reducing the pet’s exposure to the causes of allergies. 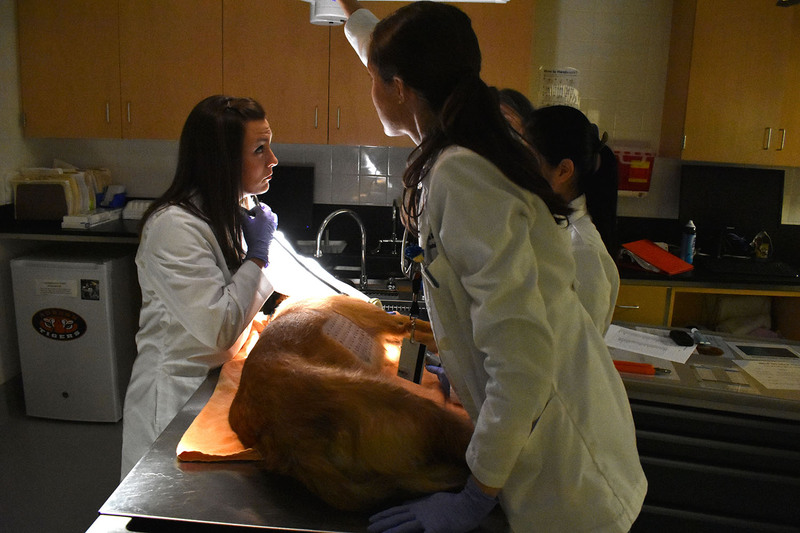 Veterinary technician Missy Streicher, right, and Dr. Amelia White, examine a patient undergoing allergy tests. Scheduling an appointment to have one’s pet seen by a dermatologist at the College of Veterinary Medicine can be done by either having ones’ primary attending veterinarian request a referral, or, a pet owner can call and make appointments directly with the service. Upon arrival, pets are treated depending on their condition. “Generally, an initial exam takes two-three hours,” Dr. White said. “Typical tests might include skin cytology and skin scraping, a skin biopsy or an intradermal (skin) allergy test. Sometimes X-rays or CT scans might be necessary.” Dr. White said. Allergies generally are not curable, according to Dr. White, but a well-developed treatment plan, along with follow-up rechecks, can significantly reduce a pet’s suffering and improve the quality of life for the pet and the owner. Click here for a short video about the Dermatology Service.